Passion (Palm) Sunday opens Holy Week, the most solemn week in the Church’s liturgical year. On this day, the Church celebrates Jesus’ entrance into the city of Jerusalem. Palms are blessed and distributed to the faithful and the Passion is read at all Masses. At the Chrism Mass, which the bishop concelebrates with the priests of the diocese, the Holy Chrism is consecrated and Oil of the Sick and Oil of Catechumens are blessed. The Chrism Mass manifests the communion of the priests with the bishop in the same priesthood and ministry of Jesus. 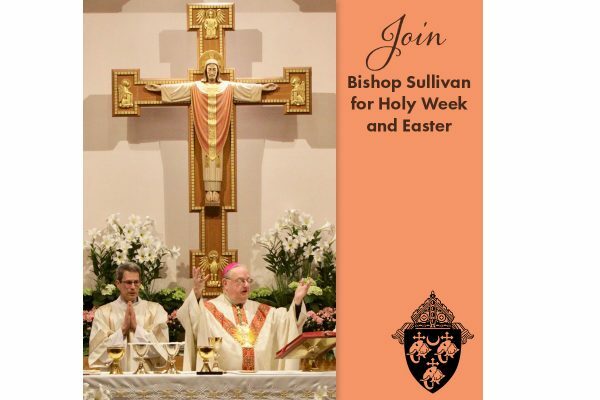 The faithful of the diocese are also encouraged to participate in this Mass. The Chrism Mass is celebrated in dioceses throughout the world traditionally on Holy Thursday morning. It is held on Tuesday in the Camden Diocese to encourage wide attendance by parishioners and parish priests who will travel from all parts of the diocese to join the celebration. This Mass commemorates the institution of the sacraments of the Eucharist and Holy Orders, and the washing of the feet of the Apostles by Jesus at the Last Supper. The Mass of the Lord’s Supper in the evening marks the beginning of the Easter Triduum (Holy Thursday, Good Friday, and the Easter celebrations). Following Mass, there is a procession of the Blessed Sacrament to a place of reposition for adoration by the faithful. Good Friday, includes the commemoration of the Passion and death of Jesus with the reading of the Passion, special intercessions, veneration of the Cross, and a Communion service. In accord with the ancient tradition of the Church, Mass is not celebrated on Good Friday. At this Mass, adult catechumens (those preparing for Baptism) will receive the Sacraments of Christian Initiation (Baptism, Confirmation and Holy Eucharist) during the liturgy. The Easter Vigil liturgy includes the blessing of the new fire, the procession with the Easter Candle, the proclamation of Old and New Testament readings (commemorating the whole of the history of salvation), the Litany of Saints, blessing of water, the renewal of baptismal promises and the Liturgy of the Eucharist. Easter, the greatest and oldest Christian feast, commemorates the Resurrection of Christ from the dead. The observance of this mystery extends through the Easter season, which lasts until the Feast of Pentecost, a period of 50 days.